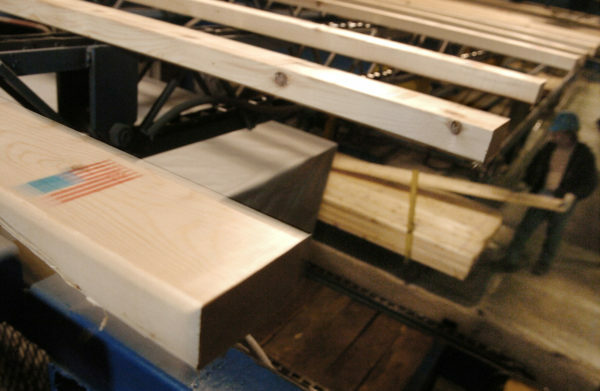 Two-by-fours cut from spruce firs make their way along a conveyor after being graded and stamped with an American flag at Pleasant River Lumber in Dover-Foxcroft in December 2007. WASHINGTON — British Columbia Premier John Horgan said after talks with Trump administration officials on Thursday he was hopeful a dispute between Canada and the United States over softwood lumber could be resolved before NAFTA talks begin in mid-August. Horgan told Reuters he saw no reason why the dispute should be part of the three-way North American Free Trade Agreement talks between the United States, Canada and Mexico, which begin on Aug. 16. Horgan met separately with U.S. Secretary of Commerce Wilbur Ross and U.S. Trade Representative Robert Lighthizer in Washington this week over an escalating trade dispute with Canada over softwood lumber exports, which is a major industry for the West Coast province of British Columbia. “I am pretty confident, based on Mr. Ross’s view, that he wants to get this done before the middle of August,” Horgan said in an interview. “NAFTA discussions will further complicate an already complicated matter and most participants in the discussion agree with that,” Horgan said. The United States slapped anti-dumping and anti-subsidy duties averaging 20 percent on Canadian softwood lumber exports in June after U.S. producers complained that Canada was unfairly subsidizing its lumber producers with low fees on timber cut on public land. Most U.S. timber comes from private land where stumpage fees are generally higher. The dispute has been festering for decades and the U.S. side has been trying to revive a quota arrangement that expired two years ago that limited Canada’s share of the U.S. lumber market. Horgan said he was frustrated by “the constant revisiting of the softwood agreement” and wants it resolved, but declined to specify how a new lumber deal could be crafted. A person familiar with the negotiations said that Canada so far has not made sufficient moves towards agreeing to a new quota system that would placate U.S. lumber producers, leaving prospects for a near-term deal in doubt. “The U.S. lumber industry’s position is that any softwood lumber deal should be negotiated separate from NAFTA discussions, and any agreement must include a clean quota that will restore fairness to the market,” said Zoltan van Heyningen, executive director of the U.S. Lumber Coalition.